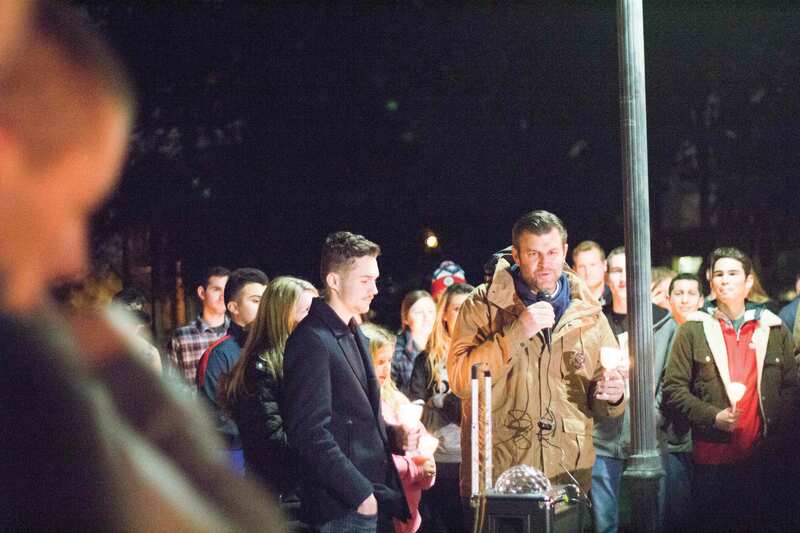 More than 150 flames gleamed in the dark on the Front Lawn Feb. 5 for the remembrance of a student who was found dead in Lake Arrowhead a week before. Friends and family spent time in silence and prayer at the candlelight vigil in honor of the 20-year-old California Baptist University and Riverside City College student Dawson Hartwig. Hartwig originally attended CBU and was a member of the men’s water polo team his freshman year and left to attend RCC. However, he was planning to return for his third year to continue his study of sports marketing. Although he left the school, his relationships with his CBU friends remained intact. Tears flowed as many supporters lit their candles in memory of Hartwig and said a prayer in his honor. The phrase was hashtagged over multiple social media platforms and written on the fence of an overpass on Interstate 210 in nearby Rancho Cucamonga. Mark Hartwig, San Bernardino fire chief and father of Dawson Hartwig, said a few words to commemorate his son’s love for others. “We want to love more, we want to love better and we want to love deeper because of Dawson,” Hartwig’s father said. During this time, Hartwig’s social media accounts have received numerous posts of stories that showed his character during his time on Earth. “Dawson was just the type of guy that could see something as ordinary as a dirt field and use it to make someone feel like the most cherished person in the world,” wrote Madison Perry, CBU alumna, in a Facebook post. Although students said they will miss his physical presence, his memory and his character still burns bright for them. A memorial service was held at Water of Life Community Church at 11 a.m. Feb. 7 where over 3,000 gathered to remember Hartwig.